Finished your cross-stitch kits? Ready for more crafting, or maybe planning ahead for Chr*stmas presents? I know, it's not even December, but maybe you're one of those organised types. Or maybe you're like me, and enjoy buying presents for "friends" that accidentally stay in your cupboard beyond 25 December. I've rounded up some deliciously easy craft kits to sew your own menagerie of animals. Buy them for nieces and nephews, or make them yourself during some Sunday afternoon quiet time. This kitten basket kit is making me hyperventilate with cuteness, so excuse me while I breathe deeply into this paper bag. Sew together the pre-cut felt shapes to make a family of kittens and add buttons for their bonky eyes. Then follow the instructions to turn the cardboard box into a basket and wind the leftover thread into a ball for them to play with while you're not looking. I love them! I have already named them! They are £10.50 from Crafts 4 Kids (for kids? Surely some mistake). Too twee? 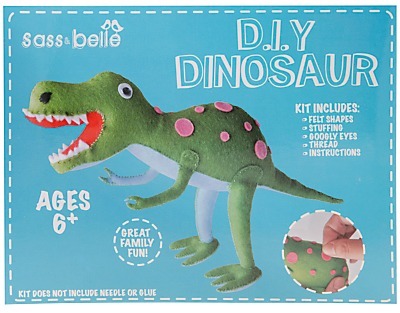 Then why not make your own dinosaur with this DIY kit from Sass & Belle. Look at his happy face! He's trying to be fierce but those pink spots mean he'll never be scary. He's just £6 from John Lewis. 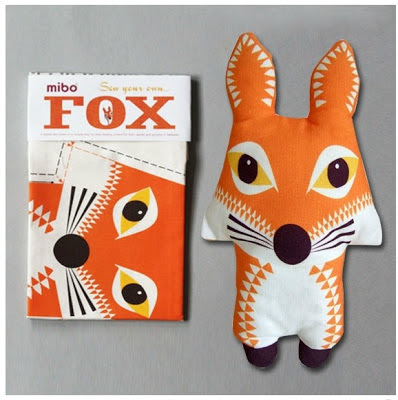 Mr Fox comes in the form of a tea towel. His dual purpose is ideal if you like the idea of craft projects, but know there's a slim to middling chance of them being quietly left on the bedroom floor. You need a needle, thread and stuffing, and the ability to follow the instructions on the tea towel (so don't over-excitedly chop it into bits, lament the fact you don't know what you're doing, and end up with something that looks more like a demented mouse). He's £10.99 from The Oak Room, who also do a sew-your-own-lion kit. Oh yes. I'm a fan of Marmaduke the cat as well. His EARS! I love him! And now you can sew them some friends! Aww.